Comes standard with 3 antique brass Newbury Pulls w/faux Keyholes on drawers and 2 antique brass D-Ring Pulls on doors. This unit comes with 2 adjustable shelves for the large top opening and 4 adjustable shelves for the left and right door openings in the base. The 3 drawers are on metal/nylon drawer glides and have non-functioning keyholes for decorative purposes. The doors have seedy glass panels. This unit will be drilled for component wires at the base of the top TV section as well as at the top of the lower left and right door sections. Please note that the upper shelf and vertical dividers are fixed, and the unit has a beadboard interior back. The top is not flat, but rather has an inset that is 56 W x 14 D x 3/4 H. As it is intended to sit against a wall, the unit has an “unfinished”, stained back. 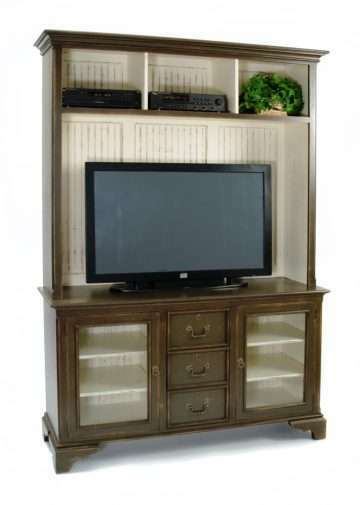 Order NH89 if not using this unit as a TV/media unit, which will not be drilled for component wires. Base Only is available as NH89B-Newbury Buffet. Ships in 2 corrugated cartons: Cabinet top w/shelves ( lbs) and cabinet base w/shelves ( lbs) on 1 wooden pallet (50 lbs).